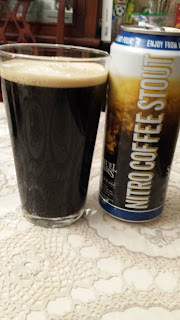 This week's Sunday Night Suds looks at Samuel Adams Nitro Coffee Stout. The Samuel Adams Nitro Coffee Stout is one of two Samuel Adams beers which come in the nitro can packaging. (The other beer is the Nitro White Ale which was reviewed here - http://kosherbeers.blogspot.com/2017/06/sunday-night-suds-samuel-adams-nitro.html). Unlike many other coffee stouts, the Samuel Adams Nitro Coffee Stout actually has coffee added, which should be unnecessary when you are brewing a beer intended to be this kind of stout. The website explains that the Nitro Coffee Stout derives its flavor from the dark roasted malts in combination with Sumatran & Indian Monsoon Malabar coffees. It was odd to me, since when I poured the beer into the glass (see picture above) it looked and smelled like a Guinness Stout. The beer was not overwhelming coffee in flavor, nor was this anywhere as thick as a traditional stout. The widget in the can gave the beer some thinness, perhaps shooting for the effect of the rocket widget in the Guinness bottle, but again this was not Guinness. But it was a pleasant light stout with some chocolate and coffee notes and I could see having this again, perhaps with a coffee rubbed flank steak. The Nitro Coffee Stout is under the Kosher Supervision of the Star-K and has a Star-K certification mark on the bottle. To see what the experts on Beer Advocate think about this brew, please follow this link - beeradvocate.com/beer/profile/35/186736.